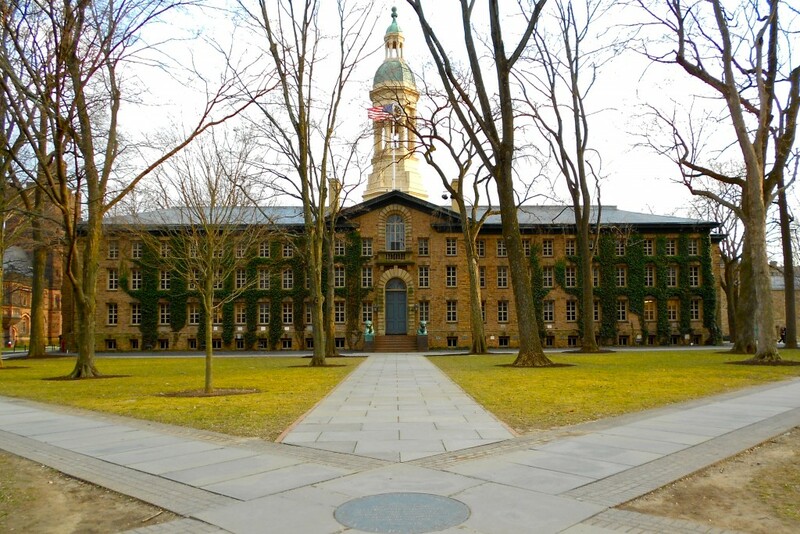 Nassau Hall first opened its doors on November 28, 1756. The College of New Jersey (Princeton) at that time consisted of its president, Aaron Burr, 70 students, and three tutors. Robert Smith, the carpenter-architect who would later construct Carpenter’s Hall in Philadelphia, designed Nassau Hall with the assistance of Dr. William Shippen of Philadelphia and William Worth, a local stonemason. Construction began on July 29, 1754 on part of the 4.5 acres donated by Nathaniel and Rebeckah FitzRandolph. Smith designed the building to withstand the variable climate of New Jersey in the Georgian-Colonial style popular at the time, choosing locally quarried sandstone as building material for the 26-inch thick walls. The building has three floors and a basement, measuring 176 feet by 54 feet, with a two-story central prayer hall in the rear of the structure, measuring 32 by 40 feet. Originally, there were five entrances to the building, three in the front and two in the rear. The rooftop cupola provided an elegant final touch to a modestly constructed building. When finished in 1756, Nassau Hall was the largest stone structure in North America. 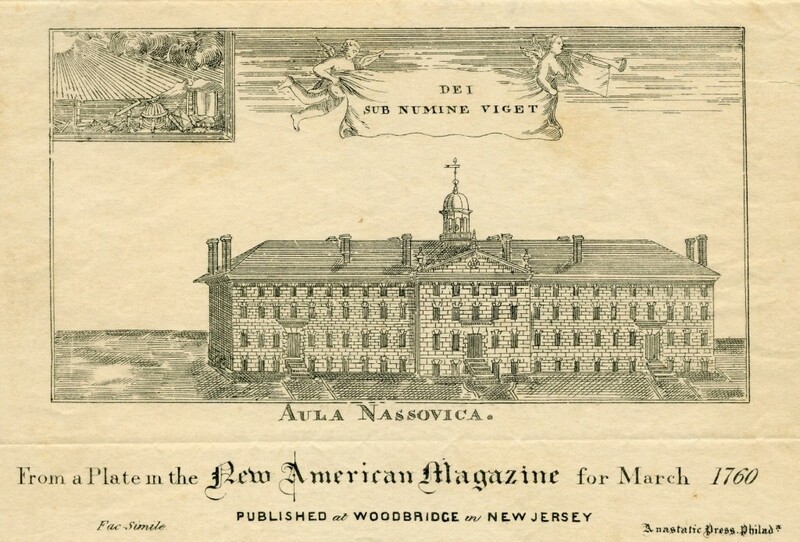 First known image of Nassau Hall, New American Magazine, 1760. Nassau Hall Iconography Collection (AC177), Box 1. Governor Jonathan Belcher of New Jersey, who granted the College its charter on October 22, 1746, suggested the name Nassau Hall. While the edifice was being constructed, the trustees of the College voted to name the building in honor of Governor Belcher. However, Governor Belcher, a Harvard graduate, modestly rejected the trustee’s proposal and suggested Nassau Hall, “as it will express the Honour we retain, in this Part of the Globe, to the immortal Memory of the Glorious King William the 3rd, who was a Branch of the Illustrious House of Nassau.” The name Nassau and Princeton have been synonymous ever since. In fact, for many years, The College of New Jersey was colloquially known simply as Nassau Hall. 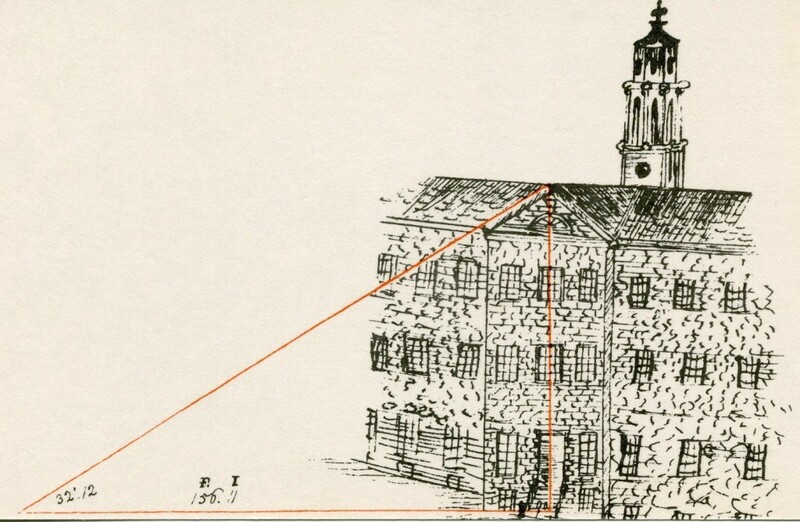 Reprint of a sketch entitled “Taking the Measure of Nassau Hall” from the student notebook of Thomas Campbell, Class of 1818. Grounds and Buildings Historical Subject Files (AC110), Box 7, Folder 10. The building was originally designed to house the entire College, with accommodations for 147 students, three to a room. In addition to student rooms on all floors, there were recitation rooms on the first floor, a library on the second floor, and the refectory, kitchen, storeroom, and additional student rooms in the basement. The interior of Nassau Hall was fairly austere. The hallways were paved with brick to guard against fire and to aid in the retention of heat generated from the many wood-burning (later coal-burning) fireplaces in the winter. The brick floors, coupled with the stone walls, also provided a cool interior during the summer months. Student rooms were composed of hardwood floors and plaster walls and their minimal furnishings were plain and unadorned. A carving in the window sill of a dorm room in Nassau Hall. Historical Photograph Collection, Grounds and Building Series (AC111), Box MP70, No. 2779. Old North, as Nassau Hall would later be dubbed, would soon be called upon to aid the colonists in the American Revolution and the fledgling national government. Scholars have often referred to the Battle of Princeton on January 3, 1777, to be the turning point of the Revolutionary War, and Nassau Hall would prove to be a steadfast symbol of American strength, perseverance, and compassion. The British occupied Nassau Hall but soon surrendered to General Washington’s troops, who had belted the structure with artillery. A scar left from an American cannonball on the south side of the west wing remains evident today. Both British and American troops who were quartered there caused great damage to the young edifice. The library was plundered, the organ in the prayer hall destroyed, and much of the furniture and woodwork was used as firewood. The Rittenhouse Orrery’s damage during the war became a symbol of national outrage, although it was actually American troops, not the British, who had broken parts off as souvenirs. Despite its ravished condition, Nassau Hall served its country as a barracks, hospital, and military prison. 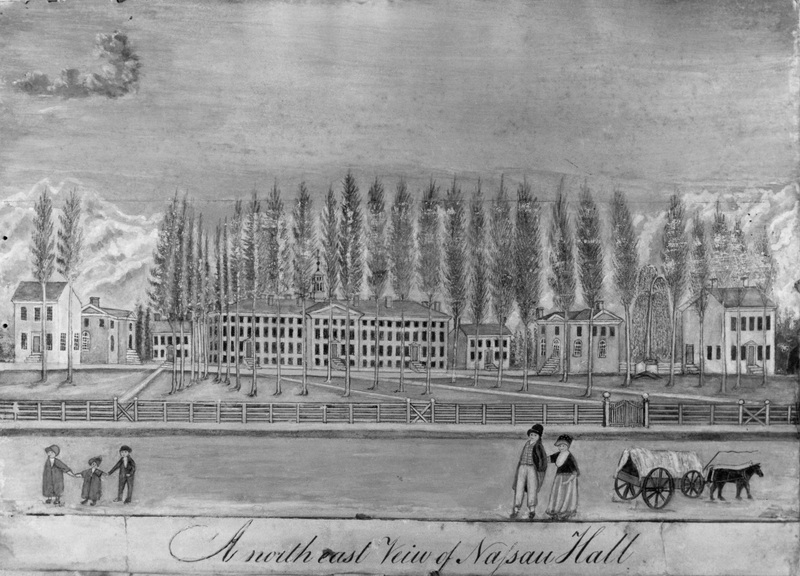 Unknown artist’s rendering of Nassau Hall, ca. 1825. Nassau Hall Iconography Collection (AC177), Box 1. In the aftermath of the war, Old North was in shambles. The College did not have the resources to fully repair the building. Nevertheless, much like a battered veteran of the war, Nassau Hall was still standing. Despite being only partially restored, Nassau Hall was ready to serve as the national capitol when the Continental Congress fled Philadelphia in 1783. Congress met in the library on the second floor and in the prayer hall on the first floor from June to November 1783. It was in Nassau Hall that Congress recognized George Washington’s leadership during the war, received the news that Great Britain signed in agreement with the Treaty of Peace, and received, from the Netherlands, its first foreign minister. 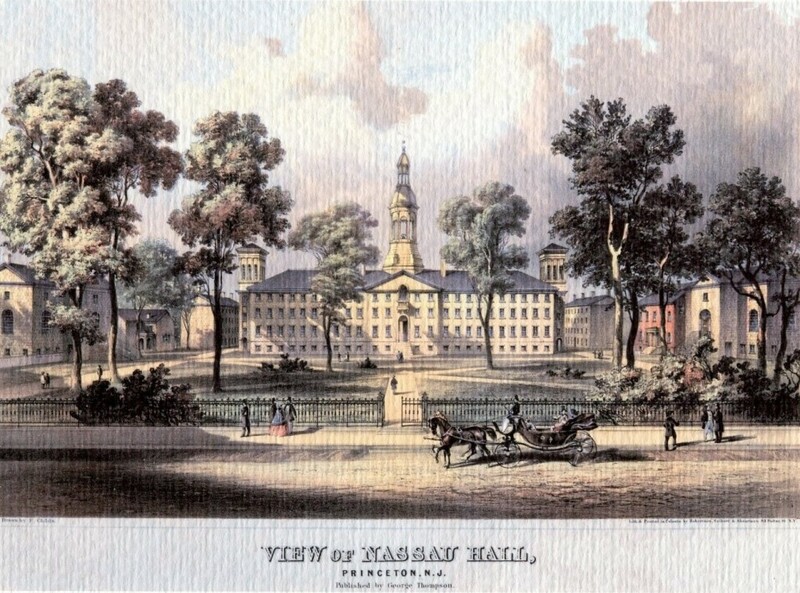 In time, funds were raised from local supporters, the State of New Jersey, and the Continental Congress to fully refurbish Nassau Hall by 1791. Less than 25 years after rebuilding, Nassau Hall fell victim to the first of two major fires. On March 6, 1802, fire broke out on the third floor. Strong winds spread the fire rapidly, engulfing the building in flames. Nearly all of the contents were lost, save for students, some of the College’s equipment, and one hundred of the library’s three thousand volumes. When the smoke cleared, all that remained of the structure were the four external walls. The College, however, once again remained resilient, and classes resumed the following month at the president’s house. John H. Bufford lithograph, 1836. Nassau Hall Iconography Collection (AC177), Box 1. Benjamin H. Latrobe, the first professionally trained architect in the United States, supervised the reconstruction of Nassau Hall and refused to accept his share of the $42,000 dollars raised to rebuild the interior. Latrobe, known for his Federal style architecture, focused his alterations on reducing the potential effects caused by fire. Latrobe raised the original roof several feet and applied a sheet-iron roof, a first in America. Latrobe also replaced the wooden floors with brick and added the stone stairs and iron railing still in use today. Latrobe also raised the belfry to permit the addition of a clock, the horizontal lintels over the three entrances at the front of the building were replaced with triangular pediments, and the circular window in the central pediment rising from the eves was replaced with a fanlight. The trustees were impressed with Latrobe’s renovations, so much so that they hired him to design Stanhope Hall to the west of Nassau, and a twin, Philosophical Hall, to the east, which was later razed to make room for Chancellor Green Library. Old North experienced a second devastating fire on an evening in March 1855. Once again, as the sun rose, all that was left of Nassau Hall were the four walls. Faculty, students and townspeople were able to remove most of the valuables, including the Charles Wilson Peale portrait of George Washington, which would soon return to its former place in Nassau Hall. The trustees, with the aid of Charles Smith Olden, raised the $38,000 necessary to cover the costs of renovations not covered by the insurance procured by the College after the 1802 fire. John Notman of Philadelphia, who designed Lowrie House and Prospect House, was hired to complete the renovations. Notman’s Italian Renaissance-style renovations were extensive. Externally, Notman removed the east and west front entrances and applied the grand arched Florentine entranceway with stone balcony and arched window above. A slate roof connected to iron beams replaced the Latrobe’s sheet iron design. Square towers, similar to the tower on the west side of Prospect House and rising a full story above the roof line, were added to each flank of the structure. Finally, the central cupola was enlarged dramatically in an effort to balance the new towers. Internally, Notman made extensive use of iron beams and brick arches to support the brick floors. The former prayer hall was enlarged to nearly double its former size to hold the college library. Perhaps the most important innovation, however, was the addition of nine furnaces to serve as the central heating source. F. Childs lithograph, ca. 1860. Nassau Hall Iconography Collection (AC177), Box 1. Note the new towers. An 1859 painting depicting the building with its towers from another angle may be viewed here. Additional renovations of 1911, 1924, and 1967 have removed some of Notman’s often criticized Florentine touches, such as the towers at each end and the overwhelming cupola, yet retained elements from each of the architectural styles applied to give Nassau Hall its present appearance of stoic grace. Nassau Hall has been the cornerstone of Princeton University for more than two centuries, withstanding war, fire, several renovations, student pranks, and protests. Thousands of young men and women from across the globe have passed through its hallowed halls in pursuit of peace, knowledge, and prosperity for the benefit of mankind. It was on the steps of Nassau Hall that Princeton University President Woodrow Wilson delivered his “Princeton in the Service of the Nation” speech. The very same steps would serve as the stage for President Harold Shapiro, some one hundred years later, when he echoed and broadened the words of President Wilson in his “Princeton in the Service of All Nations” oratory. The United States Department of the Interior named Nassau Hall a National Historic Landmark in 1960, signifying its importance in the War for Independence and in the history of the United States. Countless songs, poems, books and tributes have been written in its honor, preserving its place in the hearts of those whom pass through its doors or gaze upon its façade. Although the stones may be a bit weathered, the brass a bit dull, and the wood a bit worn, Nassau Hall continues to stand as a symbol of determination, perseverance, and freedom. Nassau Hall as it looks today. Board of Trustees Minutes and Records, 1746-Present (AC120). See Volumes I, II, III, and IV. Campus Art at Princeton’s Nassau Hall website. Savage, Henry Lyttleon, ed. 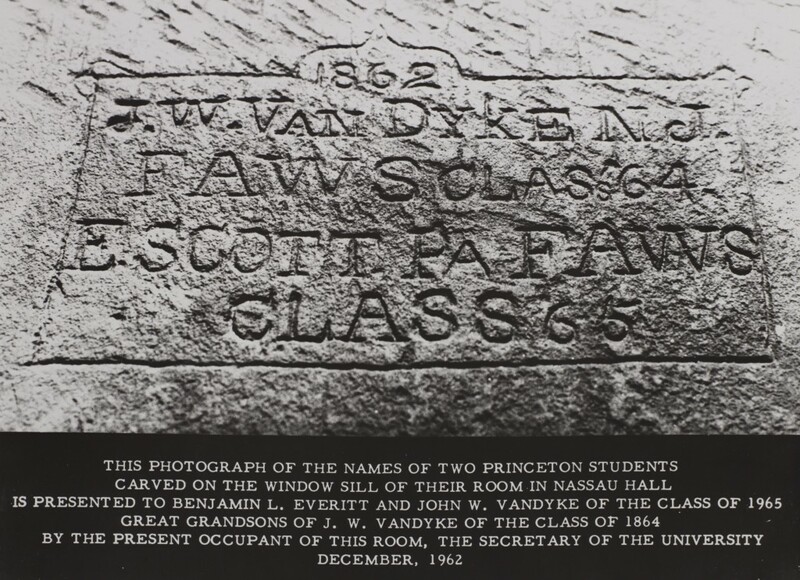 Nassau Hall: 1756-1956. (Princeton, New Jersey: Princeton University Press, 1956). Selden, William K. Nassau Hall: Princeton University’s National Historical Landmark. (Princeton, New Jersey: Princeton University Office of Printing and Mailing, 1995). Wertenbaker, Thomas Jefferson. 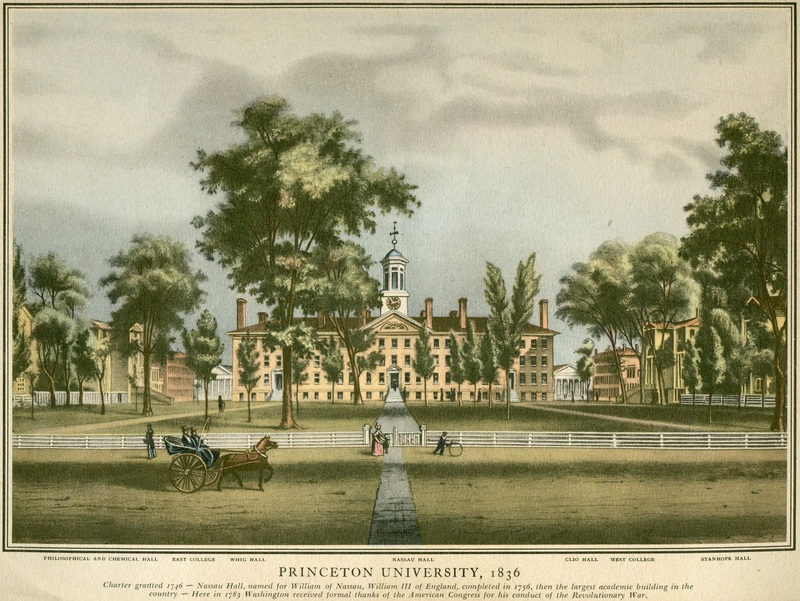 Princeton: 1746-1896. (Princeton, New Jersey: Princeton University Press, 1946). This post was originally written by Tad Bennicoff in 2003 as an FAQ for our old website. It has been revised and expanded here as part of our launch of our new website. This entry was posted in Campus Life and tagged College of New Jersey, Nassau Hall, Princeton Architecture, Princeton University by April C. Armstrong. Bookmark the permalink.